Ornette Coleman’s funeral was full of this sense of artistic limitlessness and spacey experiment, not least when Cecil Taylor — 86, delicate, gnomic — read a poem and then sat down at the piano and played an improvised several minutes that was bursting with ideas. Pharoah Sanders, on tenor, played a solo incantation that invoked the tone of his old band mate Coltrane. And Jack DeJohnette, on drums, played a dueling call-and-response machine-gun duet with the 41 year old tap-dance master Savion Glover. Also in attendance was John Coltrane’s son, Ravi. Along with pianist Geri Allen he performed “Peace”, an Ornette composition from the magnificent album The Shape of Jazz to Come. 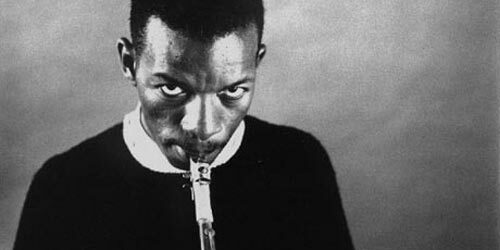 It was a fitting tribute: Ornette played at John Coltrane’s funeral. 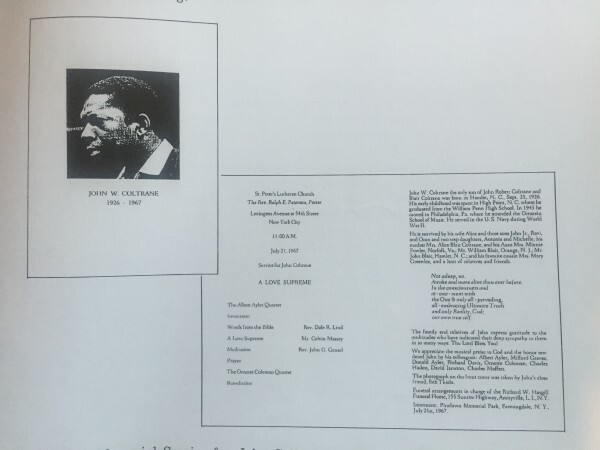 Tucked away in my box of jazz ephemera is an old tape of John Coltrane’s funeral at the St Peter’s Lutheran Church, Lexington Avenue, New York on 21 July 1967. On my crackling and stretched tape are just two tracks and a short announcement. The first piece of music was “Love Cry/Truth is marching in/ Our Prayer” and is performed by the Albert Ayler Quartet – Albert Ayler (sax), Donald Ayler (trumpet) Richard Davis (bass) and Milford Graves (drums). The second piece, Holiday for a Graveyard was performed by the Ornette Coleman Quartet – Ornette Coleman (sax), Charlie Haden (bass), David Izenzon (bass) and Charles Moffett (drums). This is a sound clip of Ornette performing at Coltrane’s funeral. So many beautiful words and dedications have been said about Ornette over the last few weeks. I don’t have anything original to add, except this short poem by a writer whose work is familiar to readers of this blog. Did NASA send a satellite sometime 50s 60s with accompanied with an Ornette Coleman music loop recording played 24/7 ? Not that I know of. I know the NSA sent a bunch of recordings up on its Voyager mission. Here is a link to the tracks sent up.